The item is a set of 120pcs 20cm 40pin jumper wires, and are made of high-grade copper wire material for safe and durable to use. 3 pieces of the 40pin breadboard jumper wires in one set will be sold together. 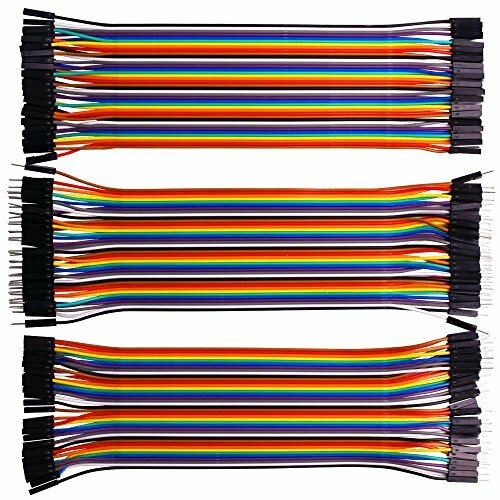 100% brand new and high quality 20cm Multicolored 40-pin Breadboard Jumper Wires Ribbon Cables. Include one 40-pin male to female jumper wires, one 40-pin male to male jumper wires, one 40-pin female to female jumper wires. The male ends meant for insertion into standard 0.1 quot;(2.54mm) female sockets and the female ends are meant for insertion onto standard 0.1 quot;(2.54mm) male headers.